We had another successful family field trip. This time, we headed up to Ventura, California to “The Old Mission San Buenaventura.” The drive was a few hours from our home and we had to stop for drinks and snacks. All that driving, looking out the window made us thirsty and hungry. When we arrived, we were amazed at how close the mission was to the beach. The weather was a little cooler than we had expected, so we covered up. We entered the mission through their store and paid our admission. Then, we went up the stairs to a room filled with artifacts and video of the mission’s history. There, we found a door that led us to the mission grounds. It was like a small piece of paradise. Almost immediately, you could feel peace as we walked through the courtyard. We made our way to the Catholic church and there we could see the history on the walls through the paintings, statues and the altar. The church is small in size but it was clear, that in that tiny place, God resides. We were witness to a man who while praying, kneeled and walk all the way down the altar on his knees. This homage to God and his presence made us feel as though he was seeking a miracle. We couldn’t help but pray for him. It was a unique experience for all of us that we won’t soon forget. Mission San Buenaventura is the 9th Catholic Mission to be constructed under the guidance of Father Serra, a Spanish Roman Catholic priest and friar of the Franciscan order. Unfortunately, he only spent three weeks at San Buenaventura before moving on to his next order. Founded in 1782, The Old Mission San Buenaventura has a long history. Throughout its legacy, it survived fire and several earthquakes. Additionally, in 1818, it was evacuated for a month as a result of a pirate attack by the Argentine, Hypolite Bouchard. The pirates spared the mission and it survived to become part of secularization during Mexican ownership. The mission was owned by the Mexican government until 1836 when it became part of the United States. In 1862, a petition requesting the Mission be returned to the Catholic Church was granted by President Abraham Lincoln. The popular mission was also visited by President William McKinley and his wife on May 10th, 1901. 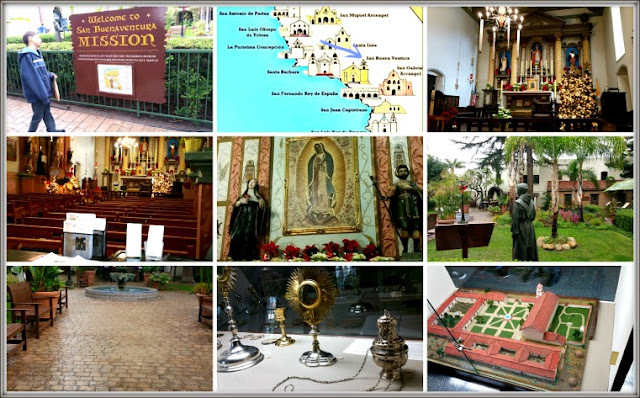 These are just a few of the historical events that took place at Mission San Buenaventura. Other interesting facts about the mission include that it was a place for trade during the 1800’s. Ships would dock only a few feet from the mission to trade for goods and services. This gave the mission the nickname, “Mission by the Sea”. After the mission was founded, a large wooden cross was placed on top of a hill overlooking the mission Church. This cross was used as a highly visible road sign for travelers in search of it. The original cross was damaged and replaced in the 1860’s due to the elements. A second cross, it’s replacement, blew down during a storm in November 1875. The hill above the mission would remain without its landmark for nearly 40 years. In 1912, the E.C.O. donated and replaced a new cross in its current location as a historical landmark. That cross is still standing today atop the hill in Grant Park and can be seen from far away. Southbound: From the 101 take the Main Street exit. Turn right at the bottom of the ramp and drive until you reach Palm Street. Turn left onto Poli St, which becomes Cedar St. Turn right onto Ferro Dr and follow it as it twists around the foothills. Northbound: From the 101 take the California Street exit. Be careful as you reach the top of the ramp, as it empties quite abruptly onto a major, and rather unmarked, intersection. Go straight towards the City Hall. Just as you turn left onto Poli St, which becomes Cedar St. Turn right onto Ferro Dr and follow it as it twists around the foothills. San Buenaventura Mission is located at 211 E. Main St. Ventura CA 93001. This blog originally appeared on FieldTripMom.com.